So imagine my feelings when walking out of my apartment, I found an advance copy of The Vegetarian Flavor Bible, sent by Page's publicist, leaning on my door. Be still my heart. Only the best songs, books or movies become standards -- go-to's. The Flavor Bible was that for me, and this food-from-plant follow up is no doubt destined to sit at the same table -- as if Sgt. Pepper was a chef. 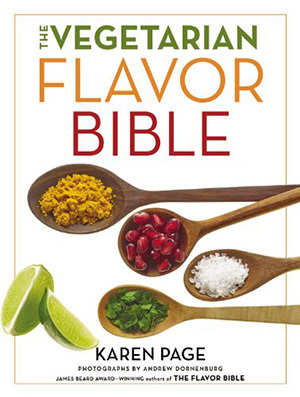 And as a chef for over 30 years, I'd rank The Flavor Bible and now its sequel, The Vegetarian Flavor Bible, in rarified air amongst my 400+ cookbook collection. As comprehensive as its predecessor, it's a must own A-to-Z reference book on plant-based cuisine for anyone who loves cooking with creativity and intuition. There are no recipes per se, but the harmonious flavor pairings found within will lead to numerous culinary money shots, guaranteed.